No Change to Look or Feel of Material. Flamecheck™ M-111 is a long-lasting, non-toxic, non-corrosive, environmentally friendly fire retardant saturant which imparts a Class "A" fire retardant finish (NFPA 701-705). When completely dried and cured, it is both odorless and colorless and is visible only under a long wave ultraviolet light. When properly applied, Flamecheck™ M-111 meets or exceeds the requirements for a Class “A” rating on most materials. Flamecheck™ meets or exceeds all Class A Flame Retardant standards worldwide, such as NFPA 701 & NFPA 705. Quart of Flamecheck M-111 covers 75-125 sqft. depending on the weight of material. This is a universal flame retardant for absorbant materials including; Natural fibers, Natural synthetic blends, Polyester, foam rubber, wood, Christmas Trees, drapes, furniture or any absorbant material. One gallon covers 300-500 sq. ft.
Click Here for Full List of Certifications, Testing & Performance Standards. Small Applications: Use the included ordinary hand operated trigger sprayer for small applications. Larger Applications: Airless spray gun with a fan nozzle of 5mm or 0.15” orifice is recommended. 500 sq.ft., or more. An airless paint sprayer that operates out of a 5-gallon container is recommended. Flamecheck M-111™ may also be applied with a sponge or a paint roller with a high nap. Surface Preparations: Be sure the material you are treating is clean and free of dust, grease and unsightly spots. SAFETY NOTE: We do suggest that you use standard paint precautions, such as providing adequate ventilation. Keep away from the face and eyes and store Flamecheck™ M-111 out of reach of children. Gives a Class A protection to most materials. For use on stage curtains, fabric, silk, wood, grass thatch, wallpaper, carpets, exhibition tablecloths, car interiors, aircraft seating, racing suits, uniforms, SWAT Uniform, stage construction or special effects staging. Will not salt out in humid conditions, can last for the lifetime of the material. UV stable and has been demonstrated to significantly inhibit sun fading and sun rot. When dry, Flamecheck™ M-111 is non-corrosive to steel, zinc plated steel, aluminum, alu-alloys..
Flamecheck™ M-111 is non-toxic, non-allergenic, and safe to use in areas of daily human contact. Non-corrosive to steel, zinc plated steel, aluminum, alu-alloys. Extremely durable and will not wear off, rub out, or dry-clean out (if percoethylene is used). Laundering will remove Flamecheck™ M-111. Reapplication is recommended after washing to maintain a Class “A” rating. 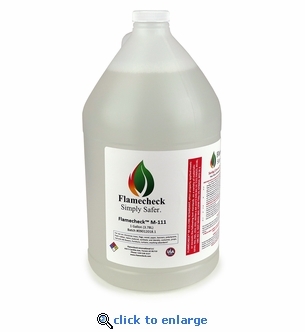 Flamecheck™ M-111 Fire Retardant Spray 32 oz.